1 Rinse chicken and pat dry with paper towels. Cut lengthwise into very thin strips (about 3 x 10 cm) (approximately 1 x 4 inches). 2 Mix together soy sauce and sambal oelek in a small bowl. Brush onto chicken strips. Place in a shallow bowl, cover and refrigerate for at least 1 hour (or preferably overnight). 3 Plunge tomatoes into a pot of boiling water. Remove, rinse in cold water, peel and cut in half. 4 Rinse strawberries in a bowl of cold water. Pat dry with paper towels and cut into pieces. 5 Rinse scallions, pat dry and cut into thin rings. 6 Halve chile pepper lengthwise, remove the seeds, rinse and dry. Cut chile crosswise into thin strips. Peel ginger root and finely grate. 7 Cut orange in half and squeeze. 8 Heat 2 teaspoons oil in a pot. Add scallions, chile and ginger and cook until softened. 9 Mix in tomatoes, vinegar and 5 tablespoons orange juice. Cook for 5 minutes over low heat. Stir in about 2/3 of the strawberries and cook for 1 minute. 10 Fold in remaining strawberries, then remove chutney from heat and let cool. 11 Rinse cilantro, shake dry pluck leaves and chop finely. Stir into the chutney and season with salt and pepper. 12 Thread chicken strips on long wooden skewers. 13 Brush a grill pan with remaining oil and heat. 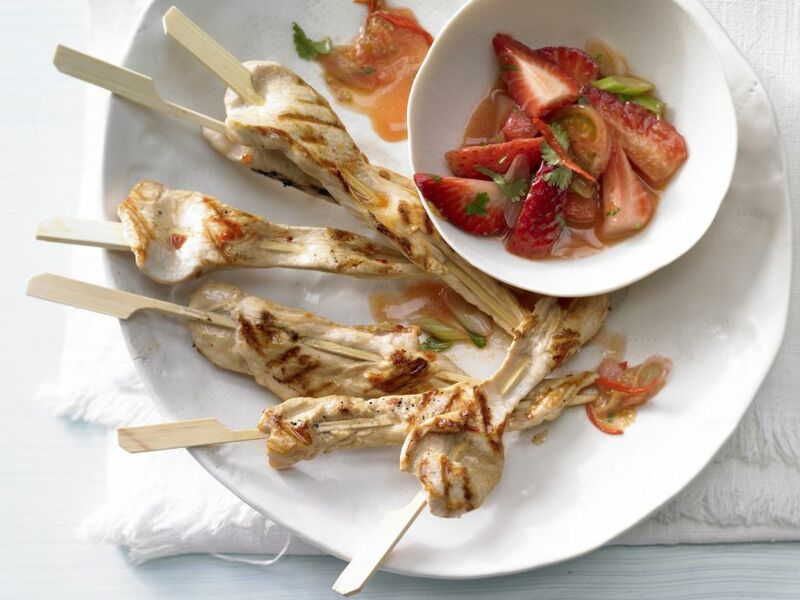 Cook satay skewers on each side for 3-4 minutes and serve immediately with the strawberry chutney.